SPOKANE, Wash. (AP) — Gov. Jay Inslee has sent a letter requesting that the remains of “Kennewick Man” be returned to Native American tribes. Inslee’s letter was sent Tuesday to the U.S. Army Corps of Engineers. Kennewick Man was discovered in 1996 in the water along the Columbia River in Kennewick. Radiocarbon dating revealed the bones were about 8,500 years old. DNA analysis now shows a genetic link to modern Native Americans. Inslee is asking that the remains be given to the appropriate tribes as soon as possible. He says tribes in Washington have waited nineteen years for the remains to be reburied. Inslee asked the corps to provide a timeline for the return of Kennewick Man and offered assistance from the state Department of Archaeology & Historic Preservation. 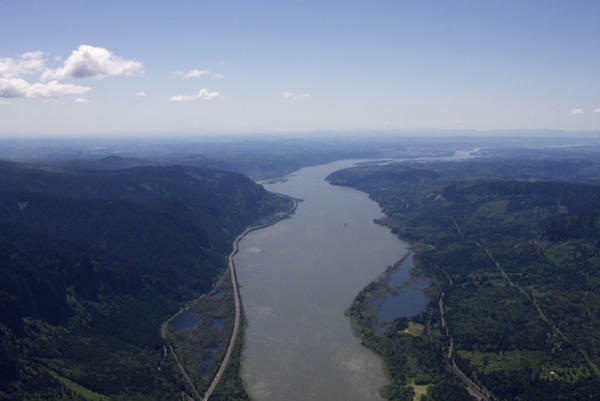 An aerial view of the Columbia River. A new oil refinery is the last thing you might expect Washington Gov. Jay Inslee’s administration to be courting. After all, Inslee has developed a national reputation as a champion of curbing the use of fossil fuels. And yet, Inslee’s administration has worked for months to facilitate such a project along the Columbia River. A Texas-based energy company wants to site a combined crude oil and biofuel refinery in Longview, Washington. The company’s goal is to capitalize on low carbon fuel standards championed by West Coast political leaders, including Inslee. Two projects initially built as biofuel refineries in the Pacific Northwest now handle fossil fuels. Facilities in Clatskanie, Oregon, and in Hoquiam, Washington, failed as biofuel projects and now handle crude oil. BANGOR, Maine (AP) — Marie Harnois stands on the banks of the Penobscot River at dusk, swirling a dip net under the water, fishing for eels — something her ancestors in the Passamaquoddy tribe have done for thousands of years. Fishing has been a way of life for Maine’s American Indians since time immemorial — “Passamaquoddy” is derived from a word that means “the people who spear pollock” — and Harnois thinks it’s past time the state government’s regulators came to the table to share management of fisheries with the tribes. Like Harnois, members of Maine’s four federally recognized American Indian tribes are regrouping just as a tribal effort to forge a fishery management pact with state regulators is faltering. The tribes proposed an ambitious bill that called for regulators and tribes to craft “memorandums of agreement” about managing marine resources. The bill, which stemmed from recent squabbles the tribes have had with regulators about quotas and gear used in the lucrative baby eel fishery, was soundly rejected by a key state legislative committee in May, and it appears unlikely to pass if it reaches the full Legislature. But former Passamaquoddy tribe legislative Representative Matthew Dana, who sponsored the bill and withdrew from his seat in protest last week, said he is hopeful the tribe and state can still reach agreement without passing a law. The tribes feel as though the state is preventing them from beginning an era of cooperation with a government regulatory structure with which they have frequently been at loggerheads, he said. There are about 8,000 Maine residents of Native American descent, about 2,500 of whom are Passamaquoddies. The other recognized tribes are the Penobscot Nation, Aroostook band of Micmacs and the Houlton band of Maliseet Indians. They are descendants of the Algonquian-speaking Wabanaki peoples who lived in Maine before the time of the earliest European settlements. The tribes have harvested everything from lobsters to porpoises from Maine’s waters over the centuries. In that time, their methods have changed. Oral traditions say Penobscots would fish for eels by poisoning the water with berries and plants. Today the tribes fish mostly with modern gear. 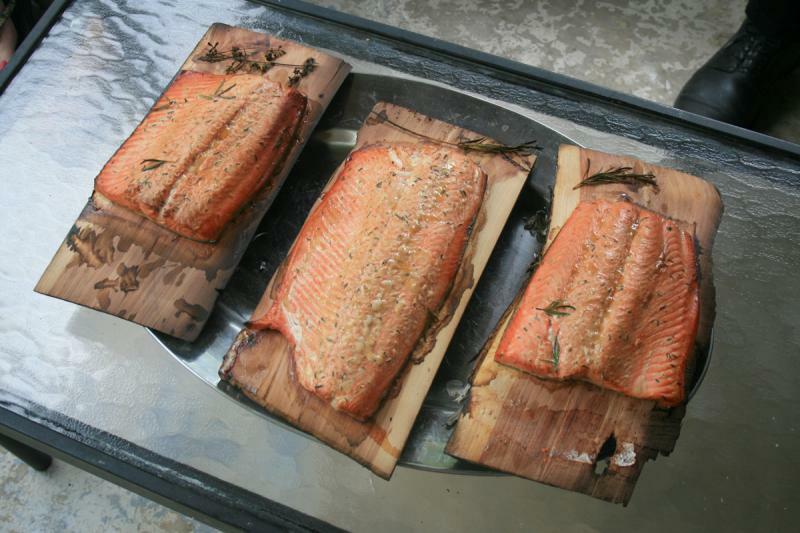 The importance of fishing to the tribes’ culture, however, has never wavered, Dana said. Tribal-state relations have a long and frequently difficult history in states around the country, particularly in managing resources, but there have been recent breakthroughs. In Washington, Gov. Jay Inslee this month signed a bill into law that creates a method for tribes to enter into pacts with the government to sell marijuana. Maine Marine Resources Commissioner Patrick Keliher is “open and committed to dialogue with the tribes,” a spokesman said. Keliher opposed the tribes’ plan for shared management of fisheries, and he and his department have sparred with Passamaquoddies in recent years. Keliher criticized Passamaquoddy leadership last month about the tribe’s use of fyke nets to fish for baby eels. The eels, also called elvers, are a moneymaking species that is highly prized in Asian markets, sometimes selling for $2,000 per pound, and are subject to strict quotas. Both tribal and nontribal members fish for them in the state’s rivers and streams. Keliher said the tribe’s gear could cause the state to exceed the quota, but Passamaquoddy leaders have said the tribe plans to continue using the nets. And a year ago, the tribe resisted the state’s effort to enforce quotas on individual tribal elver fishermen. The Passamaquoddies believe natural resources belong to all tribal members and not individuals, but they eventually agreed to the quotas. Back in Bangor, Fawn Pirruccello, one of Harnois’ sisters, was having better luck with her elver catch than she had expected. All three sisters, in fact, were doing well for the breezy, cool conditions of a May evening. While she said she’s not a big fan of the quotas, for now, state laws leave her little choice. As the federal government moves toward approving the Yakama Nation’s retrocession petition — which returns civil and criminal jurisdiction over tribal members on the reservation from the state back to the tribe — officials in Yakima and Klickitat counties are concerned that some questions remain unanswered. In Klickitat County, commissioners want to know how retrocession would affect a long-standing boundary dispute, and officials in Yakima County want to ensure there’s a formal plan detailing how tribal and local law enforcement agencies will work together once the retrocession is approved. The concerns arose, in part, because retrocession is rare. The Yakama Nation was the first tribe to propose it since state lawmakers approved the process in 2011 and Gov. Jay Inslee signed the retrocession proclamation in January 2014. The Yakama Nation’s leaders and Inslee praised it as a strong step toward greater sovereignty for the tribe to regain authority over its people. It’s known as retrocession because it returns certain criminal and civil authorities to the tribal government that the state took over in 1963 under a federal law known as Public Law 280. Once approved by the Secretary of the Interior, tribal police and tribal courts would have jurisdiction over issues involving tribal members on the reservation while the state would retain its authority over all criminal cases involving nontribal members. It sounds straightforward, but the details get complicated quickly. Since the 1.2 million-acre reservation is actually a patchwork of tribal trust land, incorporated towns and lands within the reservation that are owned by nontribal members, it’s likely to create logistical challenges for law enforcement. Yakima County Commissioner Kevin Bouchey said the county, along with the cities of Toppenish and Wapato, are worried that the petition might be approved before law enforcement protocols are agreed upon. Klickitat County Commissioner David Sauter echoed Bouchey’s concerns. Development of this type of formal agreement between law enforcement agencies is encouraged in the state’s retrocession law, but is not required. Bouchey said the county has drafted a letter expressing its concerns to the Bureau of Indian Affairs (BIA), which it plans to send this week. A spokeswoman for the federal agency confirmed in an email that the petition is under review by the BIA with input from the Department of Justice, but did not offer any details. Request for comment from the Yakama Nation’s Tribal Council was not returned. Klickitat County leaders sent their letter to BIA Secretary Ken Washburn in April to request clarification on how the governor’s proclamation defines the exterior boundaries of the Yakama Reservation. Sauter recently traveled to Washington, D.C., to discuss the issue with the agency and Washington’s elected officials as well. The county’s concern centers on a disputed 95,000 acres of land to the southeast of Mount Adams that is known as “Tract D.” It includes Glenwood, an unincorporated community of about 700. The Yakama Nation has long claimed the land as within its boundaries, including in its published maps. But Klickitat County officials say the land has clearly been in the county’s jurisdiction under state and federal law for more than 100 years. The concern for Glenwood residents is that the retrocession proclamation says it applies to everything within the reservation’s boundaries, and the county wants reassurance that the state and federal interpretation of those reservation boundaries doesn’t change, said Klickitat County Prosecuting Attorney David Quesnel. Glenwood-area residents told the Goldendale Sentinel that they didn’t want to have to go to the Yakama Nation’s Tribal Court to get divorced or to deal with traffic tickets or criminal charges. But those concerns appear unfounded because the retrocession proclamation only returns jurisdiction over tribal members to the tribe, it doesn’t give the tribe authority over nontribal members, said Yakima County civil prosecutor Terry Austin. The exceptions would be for civil matters such as domestic relations or juvenile delinquency for families in which one parent is a tribal member. Then, either the tribal court or state courts could decide the case. As far as the boundary dispute, a spokeswoman for the governor’s office said the retrocession proclamation deals only with jurisdiction and does not in any way change existing reservation boundaries. In fact, the governor does not have the authority to change reservation boundaries, which is a federal issue. In a 2000 federal court case over the Yakama Nation’s attempts to ban alcohol sales on the reservation, the state argued that “Tract D was not historically considered to be within the surveyed boundaries of the Yakama Reservation” and the state does not recognize it as being within the exterior boundaries. The court later threw out the tribe’s attempts to ban alcohol sales in the reservation’s incorporated towns where a majority of the nontribal residents live, limiting the tribe’s authority to regulate nontribal members. The retrocession petition also keeps existing limits on the tribe’s authority over reservation residents who are not tribal members, but expands its ability to self-govern. Once the details get worked out, county officials say they support that. “They have a right to self-regulation and we’re not trying to interfere with that; we just want clarification,” Quesnel said. Gov. Jay Inslee wants to change the cancer risk rate used to set state water quality standards from one in one million to one in 100,000. That is unacceptable to the treaty Indian tribes in western Washington. We refuse to accept this tenfold increase in the risk of getting cancer from known cancer-causing toxins, and you should, too. The cancer risk rate, along with the fish consumption rate, are key factors in determining how clean our waters must be to protect our health. The more fish we eat, the cleaner the waters must be. Water quality standards are supposed to protect those who need protection the most: children, women of childbearing age, Indians, Asian and Pacific Islanders, sport fishermen, and anyone else who eats local fish and shellfish. When the most vulnerable among us is protected, so is everyone else. The federal Clean Water Act requires that states develop water quality standards to ensure our waters are clean enough to provide healthy fish that are safe for us to eat. But the state has been operating under outdated and inadequate water quality standards developed more than 20 years ago, and has missed every deadline since then for updating the standards as required by federal law. The state admits that its current water quality standards don’t adequately protect any of us. Under his plan, Inslee would correctly increase the fish consumption rate from a ridiculously low 6.5 grams per day (about one bite) to 175 grams per day, the same protective rate as Oregon’s. But he would effectively cancel out that improvement by decreasing our protection under the cancer risk rate. Further complicating matters, Inslee ties development of the new state water quality standards to a $12 million statewide toxics reduction program that will require legislative approval. That is unlikely given the $2 billion state budget shortfall. Inslee’s proposal would also require the Legislature to grant the Department of Ecology more authority to regulate toxic chemicals. That is also highly unlikely given the Legislature’s historic reluctance to grant Ecology more power to control chemicals in our environment. The plan also calls for revising standards for 167 chemicals that the Clean Water Act requires states to monitor in our lakes, rivers and marine waters. But standards for 58 of those – including cancer-causing chemicals like dioxins and PCBs – will stay the same. At its core, Inslee’s plan does more to preserve the status quo than result in any real improvement to our water quality standards. It is a political solution to a human health issue. The concept of a larger toxics reduction program to tackle pollutants at the source is a good one, but it is not an acceptable substitute for strong water quality rules. We should have both. We know that Inslee and previous governors have struggled with updating the state’s water quality rules for decades because of complaints by industry that new water quality rules could increase their cost of doing business. But an economy built on pollution cannot be sustained. Fortunately, at the request of the tribes, the U.S. Environmental Protection Agency has said it will step in to develop new standards this year if the state is unable. EPA Regional Administrator Dennis McLerran announced in December that the agency will keep a close eye on the progress – or lack of progress – of the state’s effort to update our water quality standards. The agency has begun a rulemaking process in parallel with the state effort now under way. If the state develops standards acceptable to EPA, the agency will pause and work with the state to finalize the new standards. If the state is unable, EPA will continue its process and adopt new standards for the state. This promise by EPA Administrator Gina McCarthy and Regional Administrator McLerran demonstrates true leadership. They clearly recognize the federal government’s trust responsibility to protect the health and treaty rights of the tribes, which also benefits everyone else who lives here. We appreciate EPA’s willingness to protect the integrity of our state’s environment and water-based resources that are central to human health and treaty rights. We hope the state will step up before EPA has to step in to make sure our water quality standards protect all of us. For more information visit keepseafoodclean.org. Washington lawmakers made oil-train safety one of the first big issues to tackle this session, holding their first hearing Thursday on ways to prevent and prepare for the possibility of a spill or derailment. Sen. Doug Ericksen, R-Ferndale, introduced his bill first, followed by a bill from Democrats, at the request of Washington Gov. Jay Inslee. The bills are being heard in this afternoon’s meeting of the Senate Committee on Energy Environment and Telecommunications. The hearing comes four days into the current session of the Washington Legislature. Northwest states have seen a dramatic increase in oil-train traffic as more crude from North Dakota’s Bakken oil patch is being sent to West Coast refineries. Ericksen’s bill requires the Department of Ecology to take charge of the review of oil-spill response plans and provide grants for equipment for first responders. He’s proposing to funnel $10 million from the Model Toxics Control Account into the Department of Ecology to pay for those grants. The bill also expands the current tax of 5 cents per barrel on oil that arrives in the state. Currently it applies only to those brought in by ship, but would apply to oil-by-rail under Ericksen’s plan. In Thursday’s Hearing Ericksen said his bill isn’t strictly focused on reducing risk of an oil-train disaster. “I believe this piece of legislation is a big step towards helping us achieve energy independence in North America and doing it in a way that will protect the citizens of Washington state,” he said. Representatives of oil and rail companies testified in support of Ericksen’s bill. Environmentalists weren’t so pleased with Ericksen’s bill. “From our standpoint it simply lacks meaningful safeguards necessary to protect our communities in the face of this growing threat that we see to our land, our waters, from the movement of oil trains,” said the Sierra Club’s Bruce Wishart. Ericksen’s bill does not extend the barrel tax to oil that arrives by pipeline, nor does it increase transparency requirements from oil and rail companies, as Gov. Jay Inslee’s bill does. The governor’s bill, supported by several fellow Democrats in the Legislature, imposes new rules on tanker and barge shipments, and further extends the oil-spill taxation program to pipelines. It also grants greater authority to the state Utilities and Transportation Commission to increase staff and inspections along oil train routes through the state. Although the federal government alone has the authority to impose many safety measures, the democrats argue that states do have control over some key aspects related to transparency, accountability and taxation. The Washington Department of Ecology conducted a study in 2014 to evaluate the risks associated with the vast increase of oil transported by rail through Washington. The final report is due in March. Inslee’s bill did not get a hearing Thursday. Ericksen said he looks forward to further discussion on his bill in the Senate. SEATTLE — When Washington Gov. Jay Inslee wanted to show the connection between climate change and an unpleasant and costly consequence for his constituents, he decided to tour a sewage treatment plant. 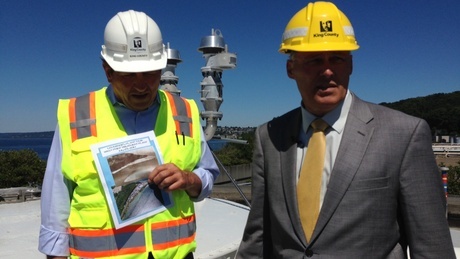 Inslee’s visit Tuesday to the West Point Wastewater Treatment Plant in Seattle’s Discovery Park was the latest stop on his statewide tour to raise awareness about the costs of climate change. The problem the governor wanted to highlight: climate change is causing sea levels to rise. And that means homes and buildings that were built a safe distance from the water’s edge are increasingly becoming too close for comfort. That message was also delivered by the White House Tuesday, when it issued a report that said global sea levels are currently rising at more than an inch per decade — and the rate appears to be increasing. No one complained about the smell as treatment plant workers and managers led Inslee and other visitors through the facility. But there was a lot of talk about the problems with rising sea level. Dan Grenet, the manager of the facility, showed Inslee some photographs hanging in the lobby. Waves crash over a cement wall. Saltwater intrusion could cost King and other shoreline counties tens of millions of dollars in infrastructure upgrades. But during this visit, as with other stops on his climate change tour, the governor emphasized that the costs of climate change will hit from all directions. Inslee’s latest task force on climate change has been charged with developing a plan to put a price on CO2 emissions. The plan is expected be presented to the state Legislature this fall. Washington is slowly moving ahead with a long-delayed plan to update its water quality rules. Tuesday’s will be the first public meeting on Gov. Jay Inslee’s proposal to dramatically increase the fish consumption rate, which determines how clean discharged water must be. But some say the proposal doesn’t go far enough. The governor’s plan would increase the fish consumption rate to about a meal a day, rather than a meal a month. It would increase the current rate of 6.5 grams per day to 127 grams per day. That’s the same rate recently adopted by Oregon, which has the strictest rate in the country. “Well, yes, but it’s important to remember that that’s just one part of this equation,” said Chris Wilke with Puget Soundkeeper Alliance, one of four groups that sued the federal government last year to force it to make the state comply with the Clean Water Act. Wilke says the plaintiffs are glad to see a more realistic fish consumption rate. But at the same time, he points out that Inslee’s proposal also lowers the bar on the allowable risk for cancer by a factor of 10, from one in a million to one in 100,000. “It appears the state has kind of engineered the standards to come out where they want them to be or where might be acceptable to business interests,” Wilke said. The state Department of Ecology says the Governor felt the compromise is necessary, because businesses have warned tightening the standard too much would prompt them to move jobs elsewhere. And instead of just cleaning up the aftermath, Inslee is pushing for additional policies to discourage use of the chemicals in the first place, to “shift people away from using these kinds of things that are so problematic for the permit holders,” said Carol Kraege, who leads the state Department of Ecology’s toxics reduction efforts. But the plaintiffs who brought suit for cleaner water say such policies might not make it through the Legislature. And they say a similar compromise was recently put forward in Idaho and rejected by the Environmental Protection Agency.